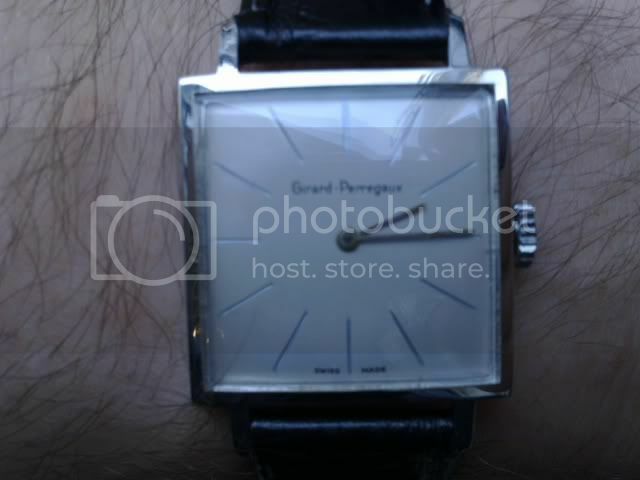 My Friend Brian Bought A Vintage Girard-Perregaux Dress Watch Today! Discussion in 'Other Watch Brands' started by SPACE-DWELLER, Mar 30, 2010. Yesterday, my friend Brian ("staun" here) bought this beautiful 1960ies Girard-Perregaux manually wound dress watch for DKR. 3,500 (US $700).. It's in pristine condition and has a stunning dial with recessed indices that are filled with a very pale green "eau de nile" colour (not luminous). 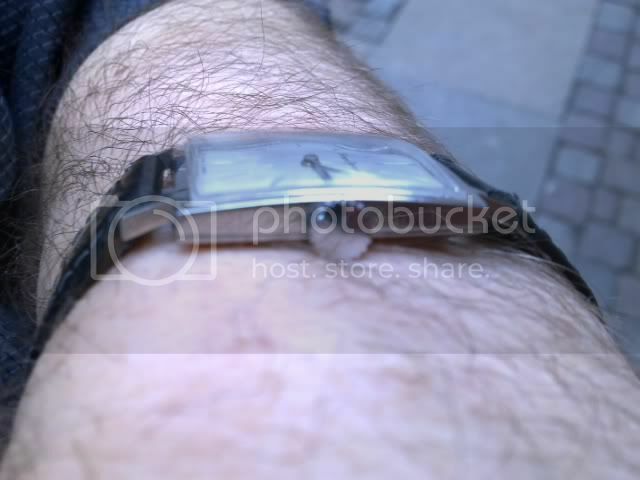 Brian is a bit camera shy, so I went ahead and took some pics of the watch on my wrist.. Sorry about the pic quality, but the pics were taken with my cellphone. Nice! The clean lines and classic style are quite tasteful. A beauty to be appreciated by all. looks great for being 1960s, how is it in comfort wise being so square? 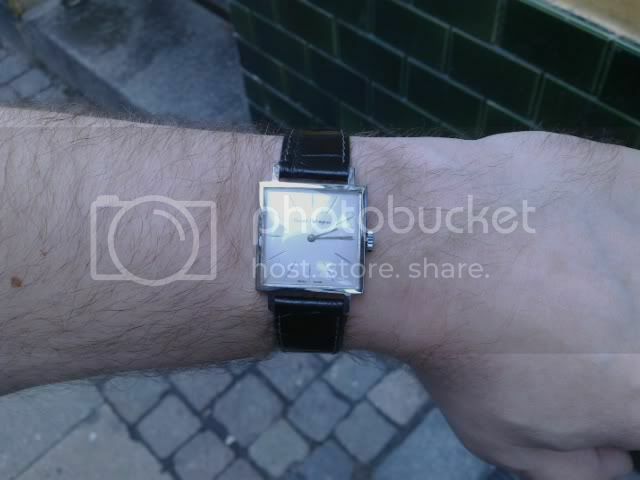 I've been looking for a dress watch, not that I dress up a lot but I've been wanting to have one. Very nice and classy I must say. Tell Brian congratulations. 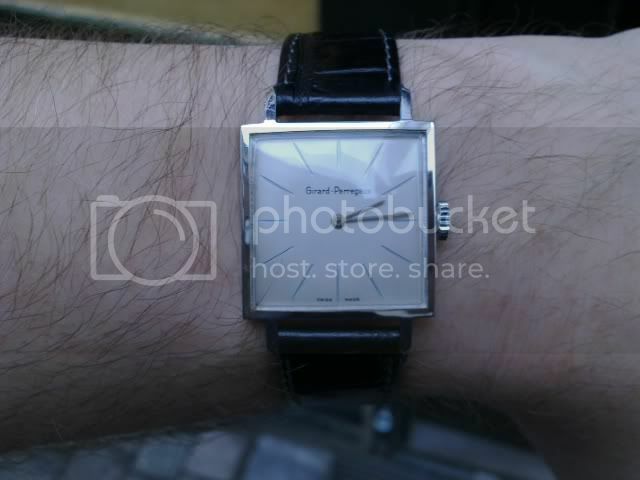 I really love those vintage Girard's, They must be one of the great bargins of the vintage watch world. Man the sixties really had some great styles!